1. 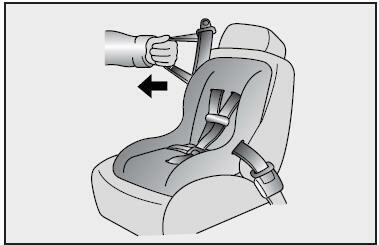 Place the child restraint system in the seat and route the lap/shoulder belt around or through the restraint, following the restraint manufacturer’s instructions. Be sure the safety belt webbing is not twisted. 3. Pull the shoulder portion of the safety belt all the way out. 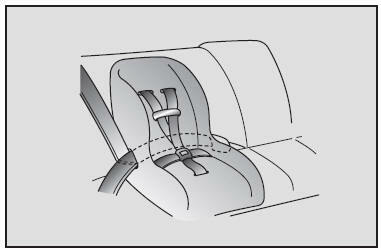 When the shoulder portion of the safety belt is fully extended, it will shift the retractor to the “Auto Lock” (child restraint) mode. 4. Slowly allow the shoulder portion of the safety belt to retract and listen for an audible “clicking” or “ratcheting” sound. This indicates that the retractor is in the “Auto Lock” mode. If no distinct sound is heard, repeat steps 3 and 4. 6. 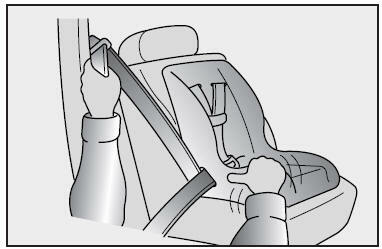 Push and pull on the child restraint system to confirm that the safety belt is holding it firmly in place. If it is not, release the safety belt and repeat steps 2 through 6. 7. Double check that the retractor is in the “Auto Lock” mode by attempting to pull more of the safety belt out of the retractor. If you cannot, the retractor is in the “Auto Lock” mode. 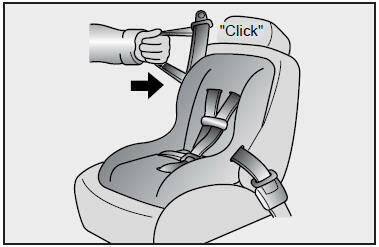 To remove the child restraint, press the release button on the buckle and then pull the lap/shoulder belt out of the restraint and allow the safety belt to retract fully. If the safety belt is not placed in the “auto lock” mode, severe injury or death could occur to the child and/or other occupants in the vehicle in a collision, since the child restraint will not be effectively held in place. When the safety belt is allowed to retract to its fully stowed position, the retractor will automatically switch from the “Auto Lock” mode to the emergency lock mode for normal adult usage.